Swoon Thursday is a weekly event hosted by YA Bound. From the book you're currently reading, or one you just finished, tell me what made you swoon. What got your heart pounding, your skin tingling, and your stomach fluttering. Shout it out on twitter with the hashtag #YABound, post it here in the comments or grab the button above and share it on your blog. 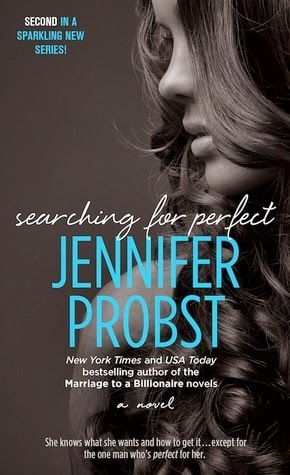 This week my swoon comes from Jennifer Probst's Searching For Perfect! I am really loving this series! "She never saw him coming. He simply took over, possessed her mouth, and buried his hands in her hair to keep her still. His tongue stroked her lips until she opened wide and gave him what he wanted. He sunk in deep, and she moaned under the gorgeous skill of his teeth and lips and tongue. Using the perfect suction, he sipped and commanded and gave, until her head spun and she grew wet between her legs. His taste and scent swamped her senses, and she hung on for the ride, already under his spell and seeing no need to fight it. He kissed her endlessly, taking his time, learning every secret of her mouth. She arched up for more and clung to his shoulders, but he never hurried, as if she were a science experiment he intended to study and learn no matter how many hours it took." That is one helluva kiss!! I love it! hope you are enjoying this book. I have it, but haven't had a chance to read it yet. Thanks Naomi! I really loved it. Another 5 star read for me. I hope you enjoy it when you get to it! A possessive kiss. You got to love those. This sounds like a series I should start. You so should Marilyn! It's really good and has a little magic in it too, which is cool. Oh wow! That was a wonderful swoon! This sounds like a good series and with swoons like that you can't go wrong! :) Thanks Teresa. There were so many swoony scenes! I love the nerd transformation with Nate in this one. Yay! This is the spinoff series and it is SO good! If you loved the Billionaire books, I think you'll love these too! Woooo! This is my next read. Excited! Thanks for sharing. I hope you like it Andrea! I'll be watching for your review! Have a great Thursday, Jess! Aww. I love this series. It's contemp romance, but has a little mystical, magic in it which makes it really cute. Let me know if you ever read it, because I'll be curious if you like it. Great swoon! I've always wanted to check out this author! After reading that swoon, even more so now! Thanks Nikki! She's really great! I think you'd enjoy the cuteness of these! Whew!!!! I LOVED this story!!!! Nate is an excellent lover! Great Swoon Jess! YES! OMG. I didn't think I would fall so hard for Nate, but Probst made me do it!!!!! I need Wolff and Gen to get together! I'm DYING.